Life Tastes Good » 2009 » July - A diary of food and wine from the perspective of a passionate cook who is inspired by the colors and flavors of the changing seasons. Please make sure that you read this entry after reading “Blue Hill in Basking Ridge, Part One.” Oh, and yes – my husband will most probably remind me that this post is waaaaay too long – so please forgive – but you foodies and wine lovers will understand why! Ok, so I know that the title of these entries is quite a statement. But I stand behind it 100%. All they (and by they I mean the “friends that will remain nameless”) needed was the vast (and gorgeous) farm outside their window showcasing the most delectable seasonal produce to compare to the real thing… Seriously. The only thing that I was regretful about that evening was the fact that I didn’t bring my camera with me. So, folks, you’ll have to settle for the google’d image that I have of the “juice” that we fueled up on when we first arrived. We started out with the most refreshing cocktail – a take on the Kachumber Cooler served at Tabla Restaurant in Manhattan. Mind you, I could have consumed 3 or 4 but I was aware that many wines were going to be showcased throughout the evening. So I stopped at one. 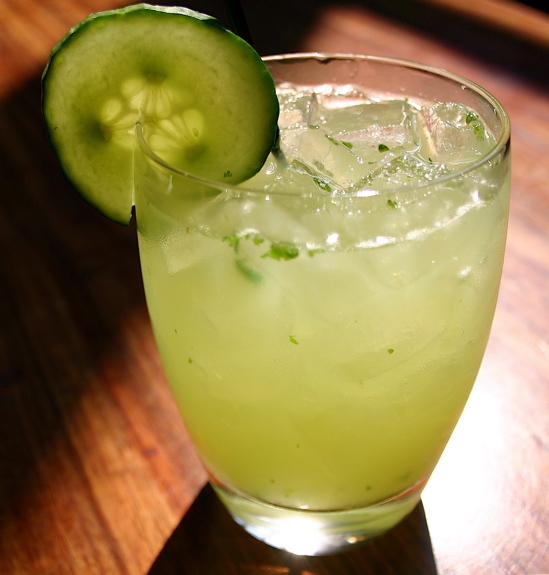 Cucumbers, lime, cilantro, and hot peppers were among the many flavorful ingredients that this libation consisted of. Delicious! The cocktails were accompanied by two tasty snacks – acacia roasted almonds and coriander scented gougeres. The almonds were absolutely delectable – and I continued to eat them as I remembered my mother telling me that 7 almonds a day helped your brain grow (something I never questioned but now tell my daughters as well – go figure!) The gougeres were so perfectly done – crispy on the outside encasing a tender puff of deliciousness. The coriander in the gougeres complemented the cilantro in the cocktail quite harmoniously. Shortly after practically licking the plates clean (no joke!) we sat for our first course. Our friends had been teasing about the fact that they were saving their magnum of Robert Sinskey’s 2007 Pinot Blanc for us. So when I saw the bottle appear from the fridge, I knew that it was time to get serious and make my friends proud. Oh and we did. The reason? Not only the exquisite qualities of the wine, but the incredible pairing that was so well thought out! They presented to us Hamachi Carpaccio with Lemon and Scallion Oil and along side was a slaw of Carrot, Radish, and Scallion. The fish was sliced perfectly thin, the colorful oil was dropped in just the right spots, and the sides of the plates were flanked with tobiko on one side and FRESH wasabi on the other creating a gorgeous plate. Sorry – no photo… It’s almost a tease, I know. The fish was incredibly fresh, and the produce used in the dish had just been purchased at a local farmers market. The fresh wasabi was almost sweet. The plate was perfection. And the wine… so perfectly balanced with citrus, floral, and mineral tones. The perfect wine for the course! We then proceeded to devour our next offering… Cold English Pea soup with Grilled Sea Scallop. Fresh, shelled peas, broth, and salt are what brought the soup to life. It was incredible. No adulterations, no enhancements. It was just fresh and beautiful; bright green and delicious; the perfect summer soup. And on top was the perfect grilled scallop. I recall my friend as he was searing the scallops say that he didn’t see any water sputtering out when the first sea scallop hit the pan. Not only did the sea scallops have the perfect crust on them, but they had the purest flavor of the sea. Our friends then mentioned that the secret was to buy really fresh fish from a trusted source. Their source (and now mine) is Metropolitan Seafood. The wine that we paired with this was the 2005 Domain Bzikot Puligny Montrachet Les Folatieres. It has a lush, rich, and full textured appeal with a beautifully balanced minerality that paired really well with both the scallop and the pea soup. The next course resulted in yet another clean plate (not at all embarrassing – I enjoyed my food!) Yukon River King Salmon and Sweet Corn Risotto with Goat cheese and French Sorrel. The salmon was cooked perfectly, flaking at each segment. The fresh corn was the perfect reminder of what month we were in, and the lemony sorrel imparted the most delicate flavor to the entire dish. What a unique combination of ingredients – and it all worked so well with the 2004 Robert Sinskey Three Amigos Pinot Noir. Delicious! The final savory course was a tribute to the end of the sour cherry season. Stunning presentation, Pork Tenderloin with New York Sour Cherry Gastrique with Roasted baby beets, baby carrots, and baby turnips. Again, our friends visited the local (and metro) farmers markets to get the most unique and seasonal ingredients. The baby vegetables were acquired through a purveyor in NYC that sells them almost exclusively to some of the big name restaurants in the area year round! It was quite the extraordinary course. Sour cherries are so versatile, and when utilized properly in savory dishes, bring out the wonderful flavors of all the paired ingredients. The sauce was savory while making me wish that I had brought a sour cherry tart for dessert! Exquisite. The wine that they paired with this course was the Sinskey 2004 Vandal Vineyards Pinot Noir. Another amazing pairing. While both Pinot Noirs showcased incredible complexity and character, the Vandal Pinot emanated cherry notes on the forefront with a silky smooth finish. This made for the final “epiphany” pairing of the evening! There was a time when it didn’t matter how expensive the entrees were, or how elaborate the wine list was when choosing a dining venue. Fortunately (for the practical me) those days are long gone, and now I look for places that are inspired by the seasonal flavors that I speak of above. Local venues are always a plus, and in addition to everything else, being a BYO is usually a deal breaker. More than half the bill can go towards beverage consumption, and that just makes me angry. But…. when there is a restaurant that far surpasses others with their dedication to supporting local, sustainable, and incredibly fresh ingredients (i.e. farm to table restaurants,) I always give them a second glance (even IF their wine list is beautiful but oh so pricey!) Oh and how thrilled I was when Blue Hill at Stone Barns came into my research. I feel so lucky to say that I’ve had the opportunity to dine at Blue Hill twice in my life – once last year in the early spring, and once in the summer. Both times, I (and the group that I dined with) ordered the Farmers Feast – a tasting menu of sorts showcasing the incredible bounty that the chef had decided to dedicate the meal to that day. The menu changes daily, and the tasting menu is catered around the diner’s dietary preferences. This is really not a tasting menu – it is an experience. I will elaborate on my favorite dining “experiences” in a later post. But I had to mention Blue Hill today as I write about the dinner that I had over the weekend. You already know a “few of MY favorite things” but today I wanted to write about one of my favorite people. My daughter to be exact. I remember when my oldest daughter was five years old… she brought home a picture that she drew in first grade (she was a young first grader.) On the crumpled piece of construction paper was what looked like a triangle with funny shapes on it; some little mounds (I thought maybe rocks); and something that resembled an upside down moon with spiky rectangles on top of it. The title of this masterpiece was “My Favorite Things” written beautifully by her teacher. And then underneath each drawing, my daughter bravely attempted to write the descriptions. She is now almost 11 years old, owns 4 cook books, has her own set of bake-ware, watches Top Chef with me, and is a huge help in the kitchen. If she and I are making a meal, I do my best to not “kid-ify” the culinary lingo. She (and most kids in general) are more apt to eating something “different” if they had something to do with the creation of it. An adventurous eater she is not, but she’ll always try something as long as it looks like food. Hopefully she will take the throne as queen foodie of the house one day and teach me a thing or two… I’d love that. Now that I’ve decided to post to a blog, I should probably mention what I am going to write about. For those of you that know me well, you are aware of my 2 passions… Food and Wine. Although they go together like 2 tasty puzzle pieces, my reasons for the admiration of the two might differ from the average F&W lover. Since childhood, I have always been interested in food. Growing up in an Indian household made me curious about many different cuisines. Comfort food to me can mean so many things. But when I think comfort, I think childhood… so I am drawn back to my favorite dishes that mom cooked. So although I have a soft spot for Mom’s traditional Gujrati cooking, I find myself intrigued with the flavors, colors, and styles of food around the world. 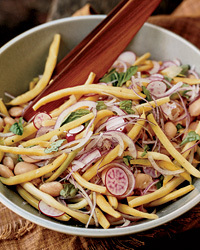 I like to focus on local, seasonal, and fresh ingredients in most of my cooking. Five years in San Francisco and a wealth of farmers markets in a 5 mile radius will spoil you… but Jersey crops are definitely competing well these days! My interest in wine came much later in life. I am learning so much every day about the wine business. But what interests me most is how one grape can taste so differently depending on the region that it is grown in. Essentially, terroir. Terroir is the French word used to denote characteristics of a specific geography: the soil, climate, farming techniques, etc that contribute to the quality of a crop. Mind you, I can’t even maintain a basil plant for more than a month – so a green thumb I certainly do not have. But I am deeply interested! Working as a personal chef for several SF and NJ based clients through the years has allowed me to experiment with so many different flavors and textures. I brought this knowledge to 56 Degree Wine, where I’ve been an associate for the past two and a half years. These are the best jobs in the world… I actually get to talk about food and wine all day long. And it tastes good too! Many posts will be focused around my meals with my family and friends. And many will highlight my weekly educational status update at the wine shop (the guys I work with are geniuses in the wine industry and are so great about imparting their knowledge to me!) But the experiences that I will be most excited to write about will be when my two passions are merged. The ultimate food and wine epiphany. I’ve had several in the past months thanks to the awesome people in my life. It is Sunday, July 5th 2009. As I begin to write my first entry for my blog, I am wondering why it has taken me so long to do this. Perhaps I can start by saying that I am not a writer. When I was young, I cringed at the idea of writing for my language arts classes. The fact that it took a forceful bribe to get me to read a chapter in a book (any book) reinforces to me that I never had a desire to dabble in the likes of literature. I am proud to say that since my childhood years, I have become very fond of reading pieces of literature focusing on subjects that are interesting to me. Oh and how that has helped me through the years with my vocabulary and speaking skills. If only my daughters would understand that (but no, they will follow in my footsteps and realize later in life.) I never “brushed up” on my writing skills, but have always admired my family and close friends who have the amazing talent of painting a picture with words on a simple piece of paper. My husband is an amazing man. Of course we have our disagreements, but he is amazing. He is so incredibly smart, such a practical and level headed guy, and so caring. It was about a year ago that he told me that he was not completely satisfied with the direction that his job was taking him and that he wanted to make a change (despite the plummeting economy.) I supported him, because I knew that whatever he put his mind to, he would accomplish. I won’t say that the last 10 months have been flowers and rainbows. Because they haven’t been. But he has handled every situation and scenario that has been presented to him with such grace and professionalism. I didn’t ask him how he was dealing with the stress – because I myself felt a bit of it as well. Until one day, I read some posts on his blog. I was so inspired. THIS was his therapy. THIS is what kept him going. THIS was his outlet. And the pieces that he wrote were very strong. Some were angry, some were funny, and some were just gosh darn beautiful. My favorite one is titled, Inspiration. You are currently browsing the Life Tastes Good blog archives for July, 2009.